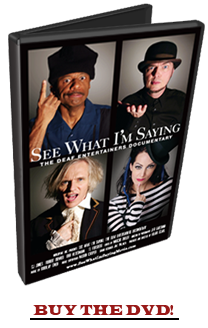 The biggest challenge the film is facing is convincing people who have never seen deaf entertainers that this film is meant for mainstream audiences. You can show your support by telling others that you want to see deaf performers featured in the media. That open captions isn't just a luxury but a necessity for almost 30 million Americans. You can help out by sending this to 10 friends and encouraging them to sign up for email newsletters on our website and getting them to come to screenings. 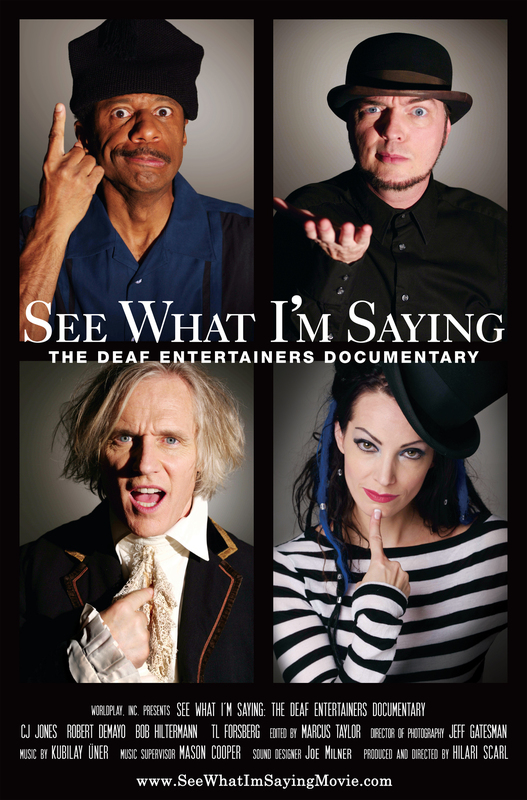 We will need your help next year when the film comes out to show your support by packing the theaters and showing that there is a market for captioned films and a demand to see performers who happen to be deaf. That will help spread this message to even more cities and smaller, isolated communities and allow us to bring this film to every community that wishes to see it. Why are there so few trained deaf filmmakers? Those who say it can't be done are usually interrupted by others doing it. -Joel A. Barker. I have been getting email requests from deaf filmmakers who want to work with me, and have brought a few on board. I encourage others to keep working and learning because the world needs you, your stories and your unique vision! 1. Get some training. Research film/acting/writing programs and schools and go! 2. Be aggressive. Go out and interview for the job. Any job you feel qualified for. Show you are confident, skilled and can bring a fresh perspective to the project. Don't let the word "no" stop you from trying again. 3. Don’t limit yourself to deaf projects. You will learn by pushing your boundaries and working outside of your comfort zone. 4. Don’t be shy to ask for favors. If you can’t afford an interpreter, there are plenty of interpreting students who would love the practice to accompany you to interviews, auditions and even on the job. Practice your interview or audition beforehand. The more prepared you are, the better. 5. Don’t be lazy. The successful writers I know practice their craft 10+ hours a day almost every day. If you work, take care of kids and have other responsibilities, you can still practice your craft with a little discipline. I know some parents who get up at 4:00 AM to write before their kids go to school. It all depends on how much you want it. There is no such thing as can’t! 6. Educate yourself. There are so many great DVD’s about directing, editing, acting and filmmaking out there. Try to visit film sets and rehearsals to watch how professionals work. Not many people are going to just invite you. You have to network, create relationships and be persistent. And yes, all of this takes time and a lot of work. 7. Learn how to be a producer. This is a tough business for everyone, filled with rejections, frustrations and barriers. Those who make it only see creativity, persistence and opportunity. Start creating your own projects - short films that you can post on YouTube. If they are good, you will find your audience. 8. Make it up as you go along. There is no one path to success - you just have to find what works best for you. Although other people's stories may inspire and perhaps give you ideas, each person's journey is unique. Ask yourself what skills you have, what skills you want to learn and how you can realistically create projects you envision. 9. Think positive. We all have obstacles and challenges, but the key is finding solutions and strategies. People like being around positive people, and are happy to help out if they have fun. 10. Remember that it is the journey, not the destination. If you don't enjoy the journey, it isn't worth it. Find a path that makes you happy and you will find joy and fulfillment in the work. I am so flattered that I am already receiving some fan mail and stories by people finding me through our online trailer for the film and through great groups like D-Pan helping me spread the word about the film. Here is part of an email and song lyrics that were sent to me by Dave Showers, a deaf musician in Indiana who is on a journey. i want to introduce myself to you. i have visited the d-pan website a couple of times and last night was the first time that i saw the clip,"see what i'm saying". it really captured my eyes therefore i kept watching it over and over again! TL was the top subject in the clip! not because she's beautiful but because i can relate to her with the hearing loss and the music. i knew i wasnt alone. my name is dave showers and i am from noblesville, indiana.i am 25 years old and i graduated at the indiana deaf school in 2003. i was born in san diego, califorina august 23rd 1983 and i was born hearing. after i was born, i had a breathing problem because my lungs were too small and the doctor had to put oxygen on me to keep me alive. eventually, my parents found that i had a hearing loss because i could not hear them when they called my name and they took me to the doctor and the doctor said that my eardrum was damaged from the oxygen and i had to wear it for a few months. it was the only way to keep me alive or else i would have died. i was still able to hear but not 100% and thats how i became hard of hearing. all my life i grew up having problems because of my hearing loss. i took speech class when i was probably 5 or 6 years old. i had to learn how to talk and learn to hear with the hearing aids. i moved to many different states because of my dad's job and because i got kicked out of the school for misbehaving. i couldnt fit in with the students at the public school or at the deaf school because i was different from all of them. hearing people mocked me because of my voice sounded different and i could not pronounce some words right. just when i thought i talked normal but it turned out that i sounded odd. deaf people mocked me because im not deaf and that i can talk and hear. not only that, they also made racist remarks because im part mexican and part white. i suffered a lot and i pretty much was in a cage in my own world. i went counseling very often to work on my issues. i had very low self esteem and i would isolate myself from everybody. sometimes, i would detest myself for being deaf because it really put a lot of pressure on me and i couldnt find my own identity. i would pretend that im not deaf or hard of hearing and i tried to convinced myself that im hearing but they could see that im hard of hearing by reading lips and the way i talk. there was no way i was able to deny it. its all there. when i was growing up, i was into music at the heart and still am to this very day. it became a part of my life and its also from my mom's side heritage. i have cousins and aunts and my mom and my sister that sings and plays instruments. i was into different music and my sister used to play the piano. i didn't play an instrument or write lyrics at the time. i was just a fan enjoying the sound of the music. i was still having issues dealing with my hearing loss because im living in the real world. i had problems at work because people got irriated by me and didnt want to communicate with me. they yelled at me because i couldnt hear or couldnt understand what they were saying. from there, i decided not to talk anymore out in public so i started writing on papers whenever i go to places. it was complicated because i was trying to accept who i am. i was always talking only to my family and some people that i trust and i was always writing on papers and signing to my deaf friends. some hearing people mocked me because my voice sounded odd and it made me very angry that i lose my confidence and i felt that i have no faith or there's no hope for my future. i just went back to the cage and isolated myself from everybody again. i was still in doubt and it made me realized that i might not be able to sing because my voice is not normal than i thought it was. in my heart, i wasnt going to give that up because music is still my passion and its my life. it has been with me since i was a kid. i still want to form a band and i am not sure if it has chosen me because for me to find out, i have to make it happen. i dont know where my path is right now though. i have talents bottled up inside of me. i dont want it go to go waste and i dont want the opportunities to pass because i still have connections with some of the bands. i want to do something thats all about passion than money. at the same time, bands have to make money because they have bills to pay. its my dream to travel the world and see different people,different culture and different environments. when i found out about TL last night, i jumped out of my chair thinking if she can do it then i can do it and the fact that she and i have so much in common. our life is the same story but a different chapters. i listened to her music on myspace and i was impressed. i kept wondering how did she do it, how did she formed her own band. i also like the beetoven's nightmare. the dude is insane on the drums! i refuse to give up my dreams and my goals. i know theres hope for me and i want to do some thing with my life than be stuck working at meijer for the rest of my life. thats when i had to contact you and asked you to have TL contact me. i am getting old now and its not too late if i get help and get inspired right away. i just cant do it alone without someone supporting me. i want to bring my music and my story to life. its the matter of time and age. i have to stop now but i could go on. talk to you soon. But my talent will get me there someday"
I love my sound supervisor. Joe Milner at Puget sound isn't just one of the most talented sound editors and mixers around, he just happens to be one of the coolest people I have met this year. Joe sends me fun emails that always seem to make my day. All of the post production people loved the subjects of the film, and would often comment about various entertainers. My colorist loved hearing stories about Bob, one consultant couldn't get enough of CJ, and TL always seems to have fans. My favorite comment about Robert, the Deaf Man of 1,000 Faces came from our Foley team that Joe was working with. I always knew Robert was an extremely cool, hip guy, but this came from a pro who has worked on hundreds of films. level, ie: "Red shirt FS" (footsteps), "Guy on right", Old Man on left" etc. named "Hip Guy FS" , "Hip Guy Backpack", etc. gut-reaction" level, he is thought of as "hip".